Welcome to the Newport Mesa Chapter! Class of 2018 Senior Send off with GLAds! Junior class of The National League of Young Men gathered for the 2015 Etiquette Dinner at the home of Julie and Jay Rutter in Newport Beach. Click on the Daily Pilot Logo below to read the full article! All League event where our young men helped distribute boxes of food and fresh produce to families. The produce was provided by the Mobile Pantry a project of the Second Harvest Food Bank. 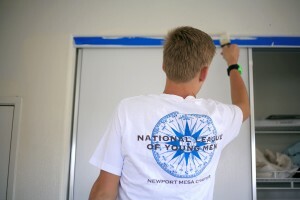 All League Philanthropy at the Lighthouse Ministries in Costa Mesa. 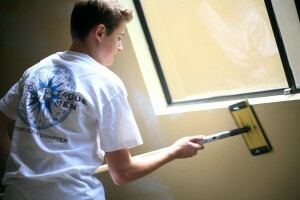 The young men helped to renovate, paint, organize and clean some of the rooms at the Ministry. The facility is run by Lindah Miles and houses up to 25 live in residents at a time and feeds anywhere from 100-500 people in our community. All grade levels of Young Men participated in a significant act of kindness when they purchased brand new school supplies and brought them to their respective fall grade level meetings. These items were then sorted and packed into pencil boxes readied for delivery to local students in the Project Success Program,who would otherwise go without school essentials. The delivery, which was coordinated with the young ladies from National Charity League, was scheduled to take place near the Holidays and made for a festive occasion which included sharing a snack, helping with homework, being a positive male role model, and most importantly, the hands on experience of helping other children.